Gutters and downspouts are common components on the majority of all residential and commercial buildings with steep slope roofs. But given their importance, why is it that architects and builders seem to fail to go through the process of designing this important storm water drainage element but leave them incorrectly sized, or even worse, not sized at all? Perhaps it is because they ‘straddle the fence’ of architectural and plumbing components. While their design documentation is shown on architectural drawings and in specifications, their design requirements are found in the Plumbing Code, which is maintained and updated separately. In 2015, the International Plumbing Code was updated to reflect new knowledge on storm drainage providing the correct sizing of gutters and downspouts as well as new Code requirements. With AGS online, we can help you to manage both architectural and plumbing components by providing up-to-date information on code requirements and calculations as well as architectural specifications. Since 1932, Architectural Graphic Standards (AGS) has sought to provide architects with the most current design practices and standards. With the power of electronic online publishing, AGS Online is able to continuously update technical and design knowledge in an industry that cannot wait on traditional book publishing. “Gutters and Downspouts: Sizing Calculations” is the first of the AGS Online series and reflects the current standard of care in building design for this subject. It includes a step-by-step design process, ICC table and figures, and a sample design problem and solution. Rational method runoff coefficient (c) is a function of the characteristic of the roof surface area. Some published guidelines recommend a coefficient of 0.75 to 0.95 for most roof surfaces; however, a conservative runoff coefficient of 1.0 is recommended, assuming an impervious roof membrane with 100 percent runoff. Drainage area of the roof (a) is the portion of the roof that is served by the gutter. The drainage area is then expressed in square feet. If the roof has parapets or walls around all of it or a portion of it, the vertical walls will contribute to additional water on the roof. Therefore, one‐half of this wall area should be added to the roof area. The resultant calculation (Q=cia) will be the flow rate for the roof design. Gutter dimensions are selected from the Horizontal Gutter Sizing Table, based on the slope of the gutter to the downspout(s) and the gutter capacity based upon the roof flow rate, in gallons per minute. To properly size gutters for installation, you need to know the local rainfall intensity. 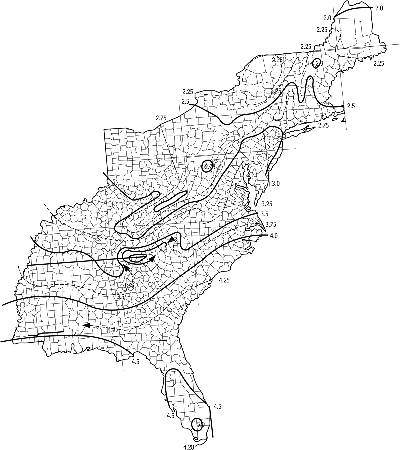 This is taken from charts in the Code based on data from the National Weather Service, National Oceanic and Atmospheric Administration for 100‐year rainfall in a 1‐hour duration, expressed in inches. Select the rainfall intensity for your building location from the figures located here. Then, convert from inches per hour to gallons per minute per square foot by multiplying the rain intensity in inches by 0.0104. According to the houselogic blog, properly sized gutters and downspouts are an integral part of keeping water away from the foundation of a structure. If the gutters and downspouts are not sized and installed properly, it can lead to severe and expensive damage to the entire building. Continuous gutters may be formed at the installation site with cold‐forming equipment, thus eliminating joints in long runs of gutter. Gutters and downspouts are available in aluminum, galvanized steel, copper, and stainless steel. Consult manufacturers for custom materials. Girth is the width of the sheet metal from which a gutter is fabricated. Although all joining methods are applicable to most gutter shapes, lap joints are more commonly used. Seal all joints with mastic or by soldering. Lock, slip, or lap joints do not provide for expansion. Expansion joints should be used on all straight runs over 40 ft. In a 10‐ft section of gutter that will undergo a 100° temperature change, linear expansion will follow these coefficients of expansion (CE) and movements: aluminum: CE, .00128, movement, .15 in. ; copper: CE, .00093, movement, .11 in. ; galvanized steel: CE, .0065, movement, .08 in. Always keep the front of the gutter lower than the back. Use a minimum width of 4 in., except for canopies and small porches. The minimum ratio of depth to width should be 3 to 4 inches. Many custom shapes for gutters and downspouts are available; consult manufacturers’ design manuals. 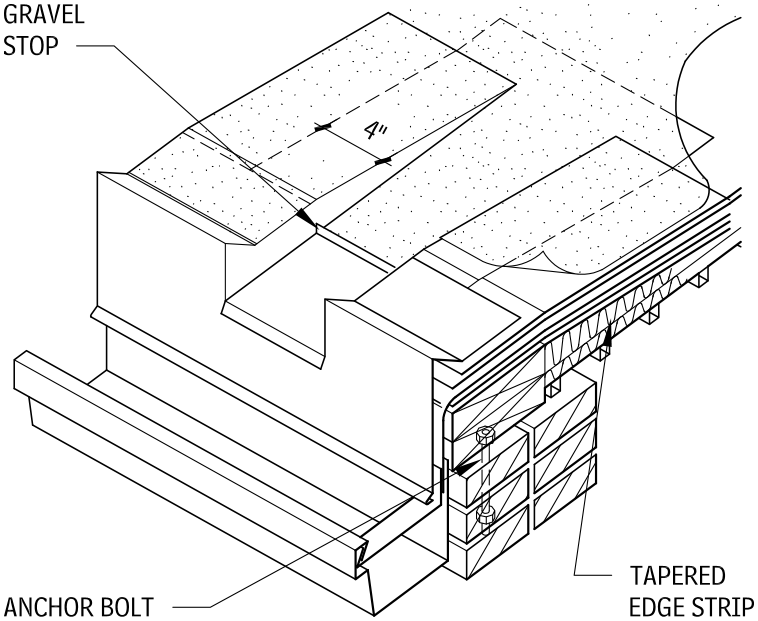 Scuppers that empty into a gutter may be integrated with a roof edge. The scuppers are soldered into a formed gravel‐stop fascia system. The suggested maximum scupper interval is 10 ft. The front rim of the gutter must be 1 in. below the back edge, and it should be below the nailers used to elevate the roof edge. The drip edge on the fascia should lap the back edge of the gutter a minimum of 1 in. The gutter must be free to move behind the fascia.